First of all, I just want to say that I’m sorry I haven’t been a very good responder to people’s comments lately. I usually make every effort to respond by email, but lately I’ve just been behind. My inbox is full of people that I’ve been meaning to get back to and I’m feeling a little overwhelmed. So, for now, I’m just going to put it on hold. I appreciate your kind words, ideas, and encourament so much and I know how much I enjoy it when someone responds to my comment, so I’ll try to get back in the groove very soon. I’ve been back to my pottery ways for the last two weeks. It feels so good to be back. The break was nice and gave me some time to collect more ideas but it feels good to be creating again. I haven’t fired or glazed anything yet, just making new things. But hopefully I’ll have some color to show very soon. 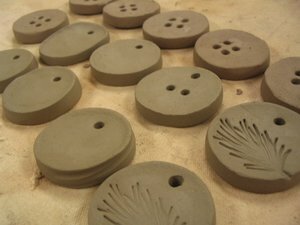 Here’s some of the things I’m working on today–buttons (of course), coasters, small square dishes (NOT ashtrays, thank you very much, Dan! ), and some pendant jewelry that I’m so anxious to glaze (and wear). Can’t wait to see the colours! Well done. mmmmmmmm, pottery….one of my life goals is to take a pottery class. Wow, all so cool! I especially like the square dishes and buttons. Ooohhh, these are so exciting Molly, very very cool. 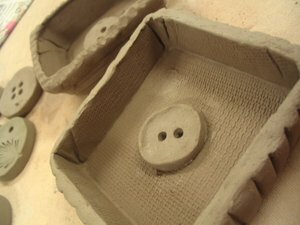 What a fun time in a pottery studio, you’re making me want to learn how to do this. We should all just agree mutually that its completely ok to not feel this pressure to respond to each comment, its supposed to be fun, not adding to stress. But, you have to respond to mine still. I’d love to try a pottery wheel just once. It just seems like it would be so therapeutic. Can’t wait to see your finished pictures. i’ve always known that someday i would love to try pottery, and now seeing this makes me even more sure of it.they all look wonderful! Wow! So beautiful…Ican almost smell the clay. reminds me of my ceramics class in high school although most of the time my projects blew up when they were being fired. that looks like fun.You don’t need to respond to my comments. I can barely keep up with the blogs I like to read. So I just don’t respond to comments. I’m just so short of my “own” time. 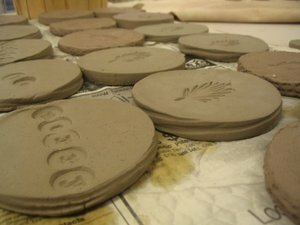 How exciting, seeing your pictures makes me want to get into pottery.